When Weddingbee had a shutterfly giveaway, I came across something new... Wink photostrips! You can get a combo of pictures put together in the style of the old fashion photo booth strips! How cool is that? It gave me the wonderful idea of placing one in each of the thank you cards we send out after the wedding. The strip could contain 3-5 different photos of us from the wedding or even mock photo booth pictures taken by our photographer. On the back, we could put a cookie cutter "Thanks for celebrating our big day with us!". The only problem is that it appears they don't do bulk strips. Their new wink photostrip site is set up to make and send each strip out using snail mail to an individual address for exactly $2.50. And while I could sit down and personalize each strip with a unique thank you on the net... If I'm sending out 200 of these, that's $500! That's more than what it will cost to make and send our wedding invites! So Wink is not an option. My first alternative to Wink was the idea of printing them myself. But with the cost of my photo ink, that would equal about the same as the photostrips or maybe even more. So, my next plan was to look at other printing sites to see if they offered prints of similar dimensions. I lucked out at GotPrint.com. 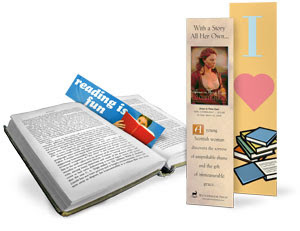 They sell bookmarks in 2 different sizes (1.5" x 7" and 2" x 8" while Wink is 2" x 6"). Plus pricing for 500 bookmarks with glossy UV coat (color front, b&w back) is around $25 ( a huge reduction in price compared to wink). If I go for the bookmarks that are 2" x 8", I can set up the photo booth image set as a 2" x 6" photostrip with a tear tab image at the bottom requesting guests to upload their own personal photos to our wedding photo sharing site (still determining best site). GotPrint doesn't sell the bookmarks with the tear tab but my rotary cutter has a perforating blade that I can use to do that. =) Also as I'll be making the strips in photoshop, I can arrange the photos exactly as I want rather than having to fit them into predesigned templates. This is looking to be the more feasible option as I can directly give many of our guests the Thank You cards to save on postage costs. Also if there are more than one guest per household, we can give them multiple strips in one envelope. With this in mind, I ordered a sample pack from GotPrint to check out all the papers and coatings they offer. While I've used their postcard sized prints for show cards in the past (2009 Oil and Ink Exhibit), I hadn't the chance to check out the entire variety of papers and sizes offered. They send you a folder with all sorts of brightly colored goodies. From looking at the paperweights for the business cards, I'm glad that I got the sample pack. I was planning on getting the bookmarks made in recycled paper (I heart reused/recycled items) but the 100lb recycled weight is too pliable for photostrips. It also is only available in matte finish and the photostrips ought to be glossy. Who else out there has just fallen in love with the little photostrip ideas? Oh man this is a great idea, especially if you're a bookworm couple. Me and Mr. AZ have a combined 16 years of University- so I think people would think this was hilarious. ...Maybe I will steal this idea! I so needed to do this when I saw the photostrips on shutterfly but the cost was outrageous. This other alternative is relatively cheap and would be just as cute. A bit of luck, random magic and fairy dust! Brown Bag Lunches and Big Yellow Buses! Trash Bin Dumpster Diving Win!